Yup. Options are unlimited. I'm probably going to create a rifle rack for range days next. Caenus wrote: It sticks out about 10" which brings the stuff farthest to the back (or front of the truck) within reach of the average person. The casters stated 125lbs max weight each. I have 6 of them and I put the two in the middle so there is no flex with what I load and likely not much that will fit in the truck. The slider can likely hold much more weight than I can pull easily. I decided that was the limiting factor so I used 3/4" plywood. If unloaded, two people can pull it completely out and free up the bed immediately. One person can do it with a little awkwardness. Awesome. I am really thinking about building one of these, especially since I might be moving early next year. 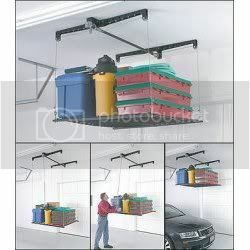 It'd come in handy for shuttling stuff around that doesn't pack well for a moving truck (like most of the stuff in the shop). Of course, I have a full-length bed in the 3/4 ton truck (just a hair under 8', IIRC). I'll have to think carefully about how far I can have this slide out and still be safe, cause 10 inches is still going to have the stuff at the back (front?) out of reach. Could build some kind of bins to use the space around the wheel wells. This is a great project, especially since it doesn't interfere with "normal" truck operations since it's removable. Thanks for posting. On a full-sized truck I'd make it smaller than the entire bed. Otherwise the overhang would be tremendous. congochris wrote: On a full-sized truck I'd make it smaller than the entire bed. Otherwise the overhang would be tremendous. Bed was a little shorter than I remembered, at a few inches under 7 feet. I'll probably start with a full 4x8 sheet and try a few mockups before I cut it down (49" between the wheel wells). That'll give you 1/2" on each side so it should roll pretty well. You can use the 1' you cut off the end to use as a backstop near the cab so things don't slide off the back when you pull it out. Caenus wrote: That'll give you 1/2" on each side so it should roll pretty well. You can use the 1' you cut off the end to use as a backstop near the cab so things don't slide off the back when you pull it out. I've also got to work out a locking system, since the tiedowns in the truck are recessed rings you hook into. Whenever I get to this (might be a while - I'm very busy) I'll share my solutions to some of my problems to help others. MikeCharlieUniform wrote: I've also got to work out a locking system, since the tiedowns in the truck are recessed rings you hook into. Miniature load-binders? Or large snap-locks, perhaps. You know, the things you usually find on a dog's leash. Find one intended for Horses. They're huge, heavy duty and they make an awesome keychain. Anotheroldfart's been using one like that for years. Clever. I probably would have come up with that eventually, since we have horses (that's why we have the truck!). We may even have some stuff I can salvage from old tack (probably not - the wife is pretty provincial about that stuff) rather than buy new. Ok that was the one thing that was bothering me was the water being out there in the open with nothing to contain the leak that will eventually happen. About how heavy would you guesstimate the bed slide is? have you guys considered the nylon/teflon rollers off the sides of drawers (like the ones in kitchen drawers) on the sides to keep it from tipping up? just put little runner rails down the sides of the bed, and put the rollers under them on the frame... would keep it from tipping and still let it roll. the ones they make of these for hearses weigh something like 600lbs to carry bigger weights, so you may not be able to get them light. It weighs less than a full sheet of 3/4" plywood. I have no idea. Heavy and awkwards enough that makes one person removal doable but only if you are in decent shape (which you are). If you want to build one, let me know and I'll try to swing by and you can check mine out and we can build yours with whatever modifications you want. All I used was a drill, reciprocating saw, circular saw and jig saw. knedgecko wrote: have you guys considered the nylon/teflon rollers off the sides of drawers (like the ones in kitchen drawers) on the sides to keep it from tipping up? just put little runner rails down the sides of the bed, and put the rollers under them on the frame... would keep it from tipping and still let it roll. I actually saw a guy that made one of those, and most of the low profile professional slides use those. They require drilling/mounting the rails to the sides of the bed which remain if you want to remove the slide. I didn't want to drill into the truck so I went bubba with this slide. Does everything I need it to do and as long as I keep the weight to the back it is fine. If I wanted to spend $600+ on a nice, low profile slide I would imagine it would have those rails. My only concern is getting sand/dirt in something like that and how easy they would slide when grimy. Know what I mean? I actually had a chance to try this out twice this weekend. I took my sister and her family to the airport and I had 4 people's worth of luggage back there. I just pulled the slide out, did a little Tetris act, and slid it back in. Probably 400 lbs of luggage. It was heavy, but it did not make me strain, and not an inkling of tipping. Without the slide, I would have had to slide the bags in and then crawl up underneath the tonneau covers to reach the bags in the back. It was very quick and efficient. Last night I picked my parents up after their cruise and their bags were pretty heavy. Same thing, pulled the slide out, laid their bags on the slide, which was actually hanging out over the tailgate and slid it in. I really like this thing. Damn good job man. I might have to have you make me a second level platform in the back of my jeep. That's a badass project. I immediately thought how cool it would be to have a spare tray, and some method of swapping them out. So you could have a preloaded bugout tray that slides in in a couple minutes. Favorite Zombie Movies: My movie consumption is shameful. Or awesome. I watch few movies. You had mentioned keeping MREs in the bed. You probably know this, but MREs are very heat sensitive, and won't last long, particularly in AZ heat under black tonneau covers. Cool project, BTW. I was very nearly an AV owner myself, but I drove a WRX by mistake, and that was the end of the AV. jamoni wrote: That's a badass project. I immediately thought how cool it would be to have a spare tray, and some method of swapping them out. So you could have a preloaded bugout tray that slides in in a couple minutes. Just back the AV into the garage and drop it down on a second bed slide, then slide it under. Perhaps a second one that is already in a roof/safari type basket to drop on top of the tonneau covers too. 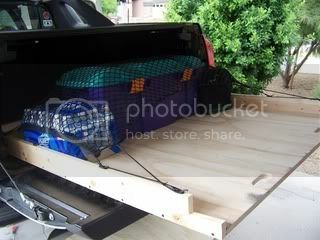 I'm still looking for the right sized basket for the tonneau cover though. Some guys over at the AV Fan club have done it both by drilling holes in their covers, then sealing them and using clamp on type mounts like the Yakima's in the pic. Some of them screwed up and they cannot open their sponson box covers all the way. That means they have to get a narrower rack that won't hold as much. I'm thinking about a 48"X60" basket and then cut the rack to accomodate the lids, then welding the cut off pieces back on. Unfortunately I don't weld so I'll just keep that one on the backburner for now. I'd essentially be able to drop in camping gear or preps for a B/O in a few seconds. Luthifer wrote: You had mentioned keeping MREs in the bed. You probably know this, but MREs are very heat sensitive, and won't last long, particularly in AZ heat under black tonneau covers. Yeah, there are two MRE's in there. They'll keep long enough. They will probably be consumed before the summer ends at one point or another. Whenever I order MRE's, I pull the ones that neither of us like out, and use them in the cars. Some time when we go out to the desert range we'll probably have them for lunch before heading back. Besides, for long term storage (like years) it's a no go. When I was in Korea we kept dozens of cases stored in a steel conex in the motorpool. We also kept them wrapped in a tarp in Iraq. I even found one behind my coax ready rack in the tank that was still in the dark brown outer bag! It must've been there for the better part of a decade baking in the heat and simmering in the FRH. We opened it up to see what it's condition was. The cheese was seperated into funk and oil, but the hotdogs still looked okay. Everything else was fine. There were no PV2's standing around to sample them for us, so I have no idea if they were safe to eat. Thank you for this. It is perfect. I am a construction superintendent and am often the one to carry all the tools. The nice thing about this one is that it doesn't add a lot of weight to the truck. I live where the gas is usually over $3.00 a gal, so it helps with the gas mileage. I like that it doesn't have the meddle casters. For the plywood haters, a buddy of mine found a composite of sorts, was maybe 1/4 ply sandwiched between similar thickness metal. Cuts easy enough that he built a replacement grille for his chevy truck from it. Had enough elasticity to permanently bend a shallow v in the center, metal kept wood from springing back.